They say pictures are worth a thousand words – here are 3 sets of slide shows that are awesome from The New York Times web site. No words are needed the pictures say it all. The photographers did an incredible job on this assignment and deserve outstanding credit for their work. It definitely was not an easy assignment to say the least. Thanks to all who contributed and know that your work is greatly appreciated. A firefighter worked in Running Springs, Calif., on Tuesday as wildfires burned for a third day across Southern California. One person was killed and four firefighters were seriously injured near San Diego, as wildfires feeding on the driest brush in years erupted across Southern California. 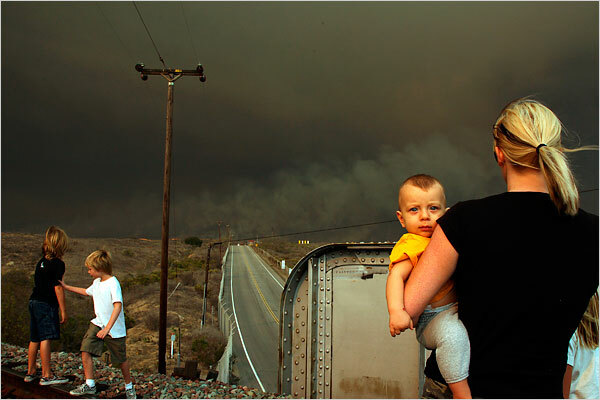 The Beaulieu family looks at a fire at the entrance of Camp Pendleton, Calif.
SAN DIEGO, Oct. 24 — Firefighters today began to assert control over wildfires that have burned through nearly 500,000 acres and displaced half a million residents over four days in Southern California. While many fires continued to burn, especially east of San Diego, and officials warned that weather changes could reinvigorate waning flames, cooler temperatures and abating winds helped greatly reduce the threat. Some fire officials were congratulating themselves on having avoided extensive loss of life, even setting dates for when the biggest fires might be brought under control. But the second-guessing that comes with any natural disaster was already beginning. Questions were being raised about how the fire-fight has been coordinated, how resources have been deployed, and whether Southern California has gotten smarter after the 2003 fires that ripped the region and its psyche, or if it has just gotten lucky. They do have in custody a suspect considered to having started at least one of the fires but can not substantiate any evidence of him being involved with any of the others but to me one is enough as far as I’m concerned. I have relatives who have a beach home in Carlsbad. I called them to see if they were ok and even though they are located about 15 miles south of the fires they are getting the soot and embers that far away. So not only does the fires destroy the property specific to an area the fires can have an effect on surrounding areas as far as at least 15 miles away. As I live in Florida I remember the fires we had in 1998 and the horrible destruction we had and even though we weren’t in the direct path we could smell the smoke and had ashes and soot all around and on some days couldn’t see the house across the street and that day the fires were over 30 miles away but the wind was in our direction. It looked like night it was so dark. We were fortunate in the fact that the winds were not as high as those in California and even though our loss was devastating it no way compared to what is happening in California. So if you can please take a minute and think of those who are facing loss and destruction and keep them in your thoughts. SAN DIEGO — A new round of evacuations was ordered in San Diego County Wednesday where officials said raging wildfires have caused more than $1 billion in property damage. Sixteen fires burning for four days across seven counties stretching from Malibu, north of Los Angeles, to the Mexican border, have killed five people, destroyed 1,500 homes, consumed 426,000 acres– or about 665 square miles– and forced between 500,000 to one million people from their homes–the largest evacuation in the state’s history. San Diego County has been the hardest hit with five separate fires, the largest of which has consumed 196,420 acres — about 300 square miles — from Witch Creek to Rancho Santa Fe, destroying 650 homes. “Clearly, this is going to be a $1 billion or more disaster,” Ron Lane, San Diego County’s director of emergency services, told reporters during a news conference. Firefighters sift through the charred home of a colleague in San Diego. •But at Qualcom Stadium, where thousands of evacuees have taken refuge, the Schlotte family of Ramona, Calif., spoke to FOX News of a different reality. The family did not own property but were renters, with no insurance to cover their losses. Ben Schlotte, a house painter, lost his work truck and equipment in the fire, and said that with so many homes destroyed in the area, his painting business was essentially finished. “All of our memories are gone,” his wife, Billy, said. •”I’m ready to go, but at the same time, I don’t want to go up there and be surprised,” said Mary Busch, 41, who did not know whether her home in Ramona was still standing. She has lived at the evacuation center at Qualcom Stadium since Monday, sleeping in her SUV with her 11- and 8-year-old sons. •”I called my home and my answering machine still works, so that’s how I know we’re OK,” said Rancho Bernardo resident Fuli Du, who packed his belongings Wednesday preparing to leave Qualcom. These are just a couple of personal stories for the full report and links to others regarding the fires please click here. I don’t know if it is me or what but I just don’t get how criminals on death row who have were proven guilty have the right to file a complaint that their executions by lethal injections are considered “cruel and unusual punishment”. Do they not consider the reason they are there in the first place and the fact that they murdered someone and that their act of murder was considered not only “cruel and unusual” and that they murdered an innocent person for their own gains or in the process of saisfying their sexuality obsessions, etc. Did they not take into consideration that taking someone’s life is also considered “cruel” to say the least. Yet they have the nerve to say that they deserve a better and more civil execution procedure. What right did they give their victims? WASHINGTON (AFP) – A month after the US Supreme Court agreed to wade into the lethal injection debate, executions are effectively on hold across the nation as courts and politicians sit tight amid a legal limbo. On September 25, the country’s highest court agreed to examine whether lethal injections — used in virtually all US executions — are “cruel and unusual” punishment, as banned under the US constitution. Since it accepted to take up the case, all but one of the executions scheduled in the past four weeks around the country have been postponed, and only a handful are still due to take place before the end of the year. “In effect we do have a moratorium. There is no determination by the US Supreme Court that no execution can happen. It’s more of a wait-and-see,” said Richard Dieter from the Death Penalty Information Center. Rights activists argue that lethal injections can be painful. During an execution, three drugs are administered to the condemned person: one to sedate him, one to paralyze him, and one to stop the heart. However, this is not always done by a medical professional. While the prisoner may appear calm, several studies and botched executions have shown that death may in fact be prolonged and quite painful. In Florida in December, Angel Nieves Diaz grimaced and shook for more than 30 minutes before finally suffering convulsions and dying. Authorities later found that the needles were inserted too far and the lethal cocktail had been injected outside his veins. In 2006, there were 53 executions in the United States, all but one through lethal injection. Now though, executions appear to have been put on hold almost by default, apart from the controversial execution of Michael Richard in Texas, just hours after the Supreme Court’s decision. This week the execution of a convicted murderer in Nevada was stayed at the 11th hour after an appeal by rights groups over the method of lethal injection to be used. William Castillo had been due to be executed at 8:30 pm on Monday October 15 but was spared following a last-ditch legal bid by the American Civil Liberties Union to the Nevada Supreme Court. In Virginia, Christopher Emmett won a reprieve late Wednesday just four hours before he was due to die for murdering a colleague. The US Supreme Court ruled he could not be executed before his appeal had been considered by the federal Appeals Court. In fact, the federal court is unlikely to rule before the Supreme Court has delivered its own verdict on the constitutionality of lethal injections. Amid such murky legal waters, the Supreme Court in Georgia on Thursday also postponed the scheduled execution of Jack Alderman, sentenced to death for murdering his wife in 1974. And in other states the legal uncertainty has prompted governors and judges to stay all executions until the Supreme Court’s ruling. But supporters of the death penalty say that this temporary suspension of the death penalty is likely to be short-lived, since the Supreme Court decision could lead to a resumption or even an acceleration of executions. “The Supreme Court has never said that any form of execution was unconstitutional, and that includes firing squads and the electric chair,” said Michael Rushford, president of a victims’ defense group called the Criminal Justice Legal Foundation. “This is a side-show, it has created delays in executions. The court will uphold, maybe they’ll make some suggestions in the decision about trained personnel doing the lethal injections. LOS ANGELES — Joey Bishop, the stone-faced comedian who found success in nightclubs, television and movies but became most famous as a member of Frank Sinatra’s Rat Pack, has died at 89.He was the group’s last surviving member. Peter Lawford died in 1984, Sammy Davis Jr. in 1990, Dean Martin in 1995, and Sinatra in 1998. The Rat Pack faded after Kennedy’s assassination, but the late 1990s brought a renaissance, with the group depicted in an HBO movie and portrayed by imitators in Las Vegas and elsewhere. The movie “Ocean’s Eleven” was even remade in 2003 with George Clooney and Brad Pitt in the lead roles. Bishop defended his fellow performers’ rowdy reputations in a 1998 interview. “He was the perfect match for the Rat Pack. He fit right in like an old shoe,” Hollywood’s honorary mayor, Johnny Grant, said Thursday. The quintet lived it up whenever members were free of their own commitments. They appeared together in such films as “Ocean’s Eleven” and “Sergeants 3” and proudly gave honorary membership to a certain fun-loving politician from Massachusetts, John F. Kennedy, at whose inauguration gala Bishop served as master of ceremonies. DESTIN, Fla. — Six friends went to a fishing tournament looking to catch some grouper. They caught an 844-pound shark instead. The fight by Adlee Bruner and friends to pull the 11-foot mako shark onto the boat from the Gulf of Mexico took more than an hour on Saturday. But when they made it back to land, it was a record for the decades-old Destin Fishing Rodeo. “It was tense,” Bruner, 47, said about the fight to land the shark, which has a mouthful of huge, fearsome teeth. “I’ve fished for 40 years. I’ve never see one that big.”Bruner and his fishing buddies were on a 52-foot charter boat with Capt. Robert Hill, about 70 miles southwest of this beach city in the Florida Panhandle. “It was like ‘Jaws,”‘ Hill said. PLAINFIELD — The case of Lisa Stebic, missing since April 30, has gotten a boost in cyberspace. 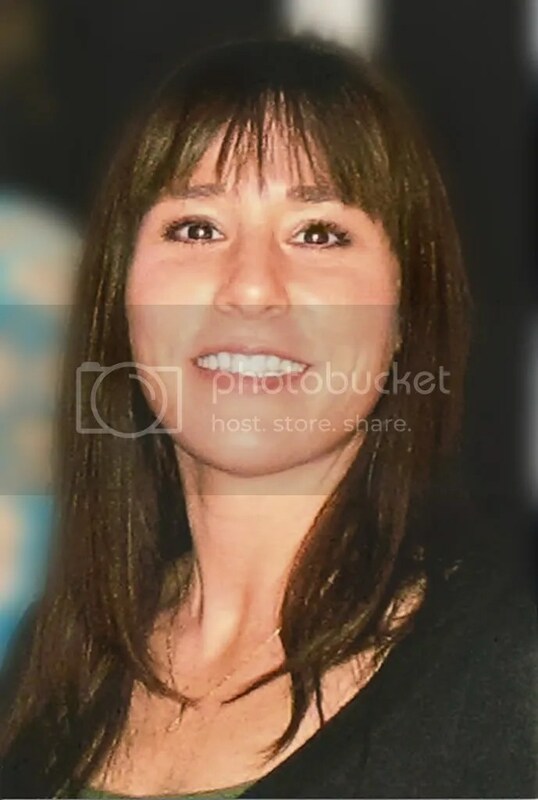 The FBI on Wednesday added pictures of Stebic, a 1987 graduate of Libertyville High School, and information about her disappearance to its kidnapped and missing persons Web site, http://www.fbi.gov/wanted/kidnap/kidmiss.htm . There was no significance of the day Stebic’s case information was added to the site, said Ross Rice, special agent and spokesman for the Chicago FBI office. “We’ve been providing cooperation and assistance to the Plainfield Police Department, and this is just one more thing we can do to help them hopefully solve this case,” Rice said. In September, the FBI page listing missing and kidnapped persons got 250,000 views. The fbi.gov Web site gets between two million and three million visits a month. craig stebic, crime, lisa stebic, missing persons.